Tooth decay occurs when there is sugar in the diet. The bacteria that is present in everyone’s mouth and which forms dental plaque, uses the sugar to produce acids and these acids damage teeth (this is called decay). 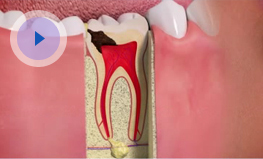 Tooth decay creates holes in the teeth and as it progresses can cause severe toothache and dental abscesses. In the early stages of dental decay there are no symptoms, but here at Dental fx, your dental team may be able to spot a cavity in its early stages when we examine or x-ray your teeth. 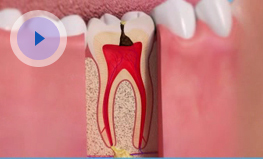 This is why you should visit us regularly, as small cavities are much easier to treat than advanced decay. What will happen if I leave it and don't get it treated early? Toothache is always a sign that you should visit your dental team immediately, as it is a warning that something is wrong in the mouth. 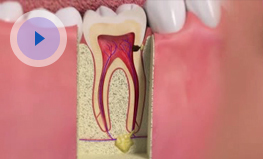 If you don't do anything, this will usually make matters worse and you may lose a tooth that could otherwise have been saved or required a more lengthier procedure which could have been avoided if it had been seen immediately. The most important way of preventing tooth decay is to restrict the amount and times sugar is consumed in the diet. Sugary food and drink should be kept to as few as possible. It is especially important to limit the number of sugary products taken every day, ideally only having them at meal times. Many people eat sugary snacks between meals or just before going to sleep and these are particularly harmful to the teeth. It is very important to develop a regular tooth brushing routine to keep to a minimum the build-up of plaque that allows the bacteria to cause tooth decay. Make sure that you brush ALL the (inner, outer and biting) surfaces of your teeth. However, even effective tooth brushing will not prevent tooth decay if the intake of sugary food and drinks is still high. This is because bacteria can stick to teeth in areas which are inaccessible to normal tooth cleaning and these areas will be susceptible to decay. Fluoride is a naturally occurring substance and it helps prevent tooth decay by strengthening the tooth and making it more resistant to the acids produced by the bacteria. Nowadays, fluoride is present in almost all toothpastes and in a number of geographical areas the level of fluoride in the water is adjusted to prevent widespread tooth decay. In other areas, there is a naturally occurring level of fluoride already present in the water. How can the Hygienist help me? At Dental fx we have three excellent hygienists, Michelle and Nicola. They will be able to show you what areas you need to take most care of when cleaning. They will also show you how to brush correctly and clean in between your teeth with ‘interdental' brushes or floss.